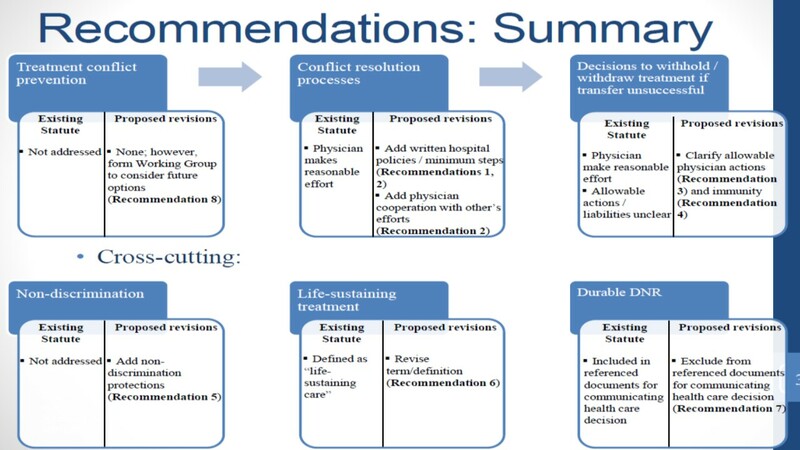 Earlier this year, the Virginia Joint Commission on Health Care (comprised of 18 legislators) was tasked with studying the current legal and regulatory environment on life-sustaining medical treatment, particularly legal requirements regarding disagreements over medical appropriateness. The JCHC determined treatment decision conflicts to be frequent. Data collected in July and August 2016 show 274 cases with ethics committee involvement from 44 reporting hospitals over the past year (roughly 6 per hospital per year). 93% were resolved through consensus, agent replacement, transfer, or death. In September, a broadly representative JCHC working group made several recommendations for legislative changes that would make Virginia law much like Texas law. I am delighted to see several of my articles cited in the report. But I have submitted comments sharing my concerns about the fairness and due process problems with the Texas mechanism. Public comments on the proposed options are due to JCHC by September 28. The comments will be considered by the JCHC at its October 5 meeting.